U.S. health officials say an outbreak of E. coli illness from an unknown source has risen to 96 cases across five Eastern states, up from the 72 cases reported last Friday. “The investigation is still ongoing and a specific food item, grocery store, or restaurant chain has not been identified as the source of infections,” the CDC said in a statement. States affected are Georgia, Kentucky, Ohio, Tennessee and Virginia. Cases of illness first began to be reported March 2, and the last reported case began on March 26. Although no deaths have been reported, “of 67 people with information available, 11 have been hospitalized” because their cases have been so severe, the CDC said. Also, “wash hands, counters, cutting boards, and utensils after they touch raw meat,” the agency said. 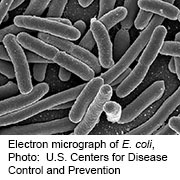 There’s more on E. coli at foodsafety.gov.